Epus. Asaphen. Comes Wilmington, Præses. The Lord Hardwicke sat Speaker, by virtue of His Majesty's Commission. The Earl of Coventry, pursuant to the said Order, presented to the House a Bill, intituled, "An Act for enclosing and dividing certain Common Pasture Grounds, called Purton Common and Purton Stoake Common, within the Parish of Purton, otherwise Puriton, in the County of Wilts." High Bailiff of Westminster to attend, about Stoppages in the Streets. Complaint was made to the House, "That their Lordships Order for preventing Stoppages in the Streets, made the First Day of this Instant February, is not duly observed." Ordered, That the High Bailiff of Westminster do attend this House on Wednesday next. L. Maitland against E. of Lauderdale. 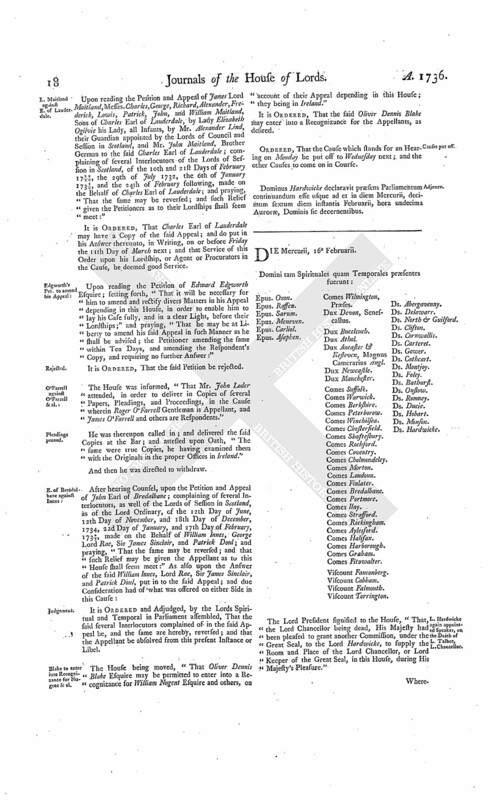 Upon reading the Petition and Appeal of James Lord Maitland, Messrs. Charles, George, Richard, Alexander, Frederick, Lowis, Patrick, John, and William Maitland, Sons of Charles Earl of Lauderdale, by Lady Elizabeth Ogilvie his Lady, all Infants, by Mr. Alexander Lind, their Guardian appointed by the Lords of Council and Session in Scotland, and Mr. John Maitland, Brother German to the said Charles Earl of Lauderdale; complaining of several Interlocutors of the Lords of Session in Scotland, of the 10th and 21st Days of February 1729/30, the 29th of July 1732, the 6th of January 1735/6, and the 24th of February following, made on the Behalf of Charles Earl of Lauderdale; and praying, "That the same may be reversed; and such Relief given the Petitioners as to their Lordships shall seem meet:"
It is Ordered, That Charles Earl of Lauderdale may have a Copy of the said Appeal; and do put in his Answer thereunto, in Writing, on or before Friday the 11th Day of March next; and that Service of this Order upon his Lordship, or Agent or Procurators in the Cause, be deemed good Service. 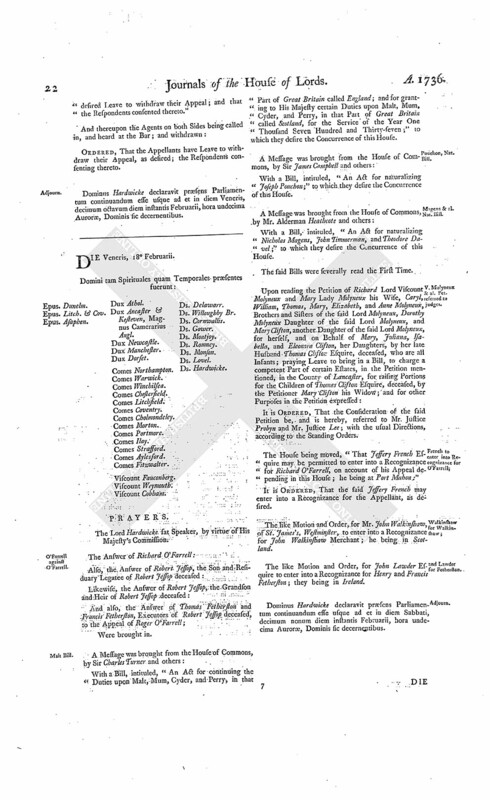 Upon reading the Petition of Edward Edgworth Esquire; setting forth, "That it will be necessary for him to amend and rectify divers Matters in his Appeal depending in this House, in order to enable him to lay his Case fully, and in a clear Light, before their Lordships;" and praying, "That he may be at Liberty to amend his said Appeal in such Manner as he shall be advised; the Petitioner amending the same within Ten Days, and amending the Respondent's Copy, and requiring no further Answer:"
The House was informed, "That Mr. John Loder attended, in order to deliver in Copies of several Papers, Pleadings, and Proceedings, in the Cause wherein Roger O'Farrell Gentleman is Appellant, and James O'Farrell and others are Respondents." He was thereupon called in; and delivered the said Copies at the Bar; and attested upon Oath, "The same were true Copies, he having examined them with the Originals in the proper Offices in Ireland." It is Ordered and Adjudged, by the Lords Spiritual and Temporal in Parliament assembled, That the said several Interlocutors complained of in the said Appeal be, and the same are hereby, reversed; and that the Appellant be absolved from this present Instance or Libel. Blake to enter into Recognizance for Nugent & al. The House being moved, "That Oliver Dennis Blake Esquire may be permitted to enter into a Recognizance for William Nugent Esquire and others, on account of their Appeal depending in this House; they being in Ireland." It is Ordered, That the said Oliver Dennis Blake may enter into a Recognizance for the Appellants, as desired. Ordered, That the Cause which stands for an Hearing on Monday be put off to Wednesday next; and the other Causes to come on in Course. Dominus Hardwicke declaravit præsens Parliamentum continuandum esse usque ad et in diem Mercurii, decimum sextum diem instantis Februarii, hora undecima Auroræ, Dominis sic decernentibus. L. Hardwicke again appointed Speaker, on the Death of L. Talbot, L. Chancellor. The Lord President signified to the House, "That, the Lord Chancellor being dead, His Majesty had been pleased to grant another Commission, under the Great Seal, to the Lord Hardwicke, to supply the Room and Place of the Lord Chancellor, or Lord Keeper of the Great Seal, in this House, during His Majesty's Pleasure." "George the Second, by the Grace of God, of Great Britain, France, and Ireland, King, Defender of the Faith, &c. To Our Right Trusty and Wellbeloved Counsellor Philip Lord Hardwicke, Our Chief Justice assigned to hold Pleas before Us, Greeting. Know ye, that We, trusting in your approved Fidelity, Wisdom, and Discretion, have constituted, named, and appointed, and by these Presents do constitute, name, and authorize you, from Time to Time, during Our Pleasure, to use, occupy, and supply, the Room and Place of the Lord Chancellor, or Lord Keeper of Our Great Seal of Great Britain, in Our Upper House of Parliament, amongst the Lords Spiritual and Temporal there assembled; and then and there to do and execute all such Things as the said Lord Chancellor, or Lord Keeper of Our Great Seal, should or might in that Behalf do, if he were there personally present, using and supplying the same Room. Wherefore We will and command you the said Philip Lord Hardwicke to attend and execute the Premises with Effect; and these Our Letters Patent shall be your sufficient Warrant and Discharge for the same in every Behalf. In Witness whereof, We have caused these Our Letters to be made Patent. "Witness Ourself, at Westminster, the Sixteenth Day of February, in the Tenth Year of Our Reign. "By the King Himself, signed with His proper Hand. The Lord Hardwicke was called upon by the Lords, to take his Place upon the Woolsack, as before. King's Answer to Address about the Murder of Porteous. 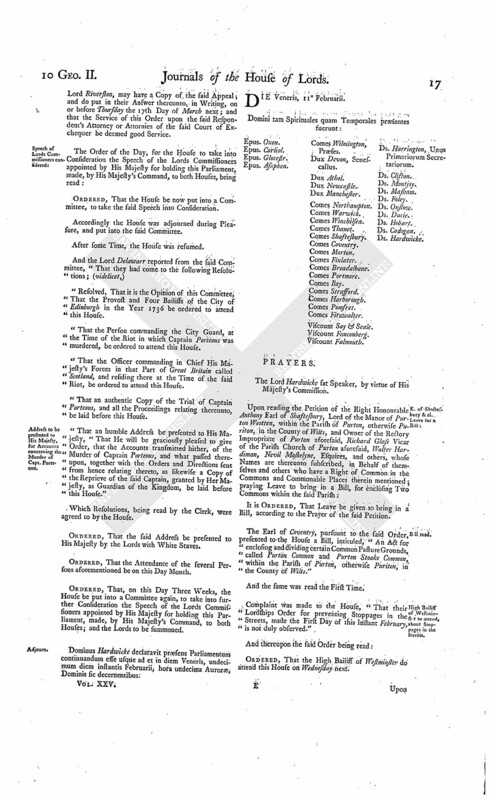 The Lord Steward acquainted the House, "That the Lords with White Staves had (according to Order) presented to His Majesty their Lordships Address of Thursday last, for the Accounts transmitted hither, of the Murder of Captain Porteous, and what passed thereupon, and a Copy of the Reprieve of the said Captain; and that His Majesty had been pleased to give Order, that the same be laid before this House accordingly." Hodie 2a vice lecta est Billa, intituled, "An Act for enclosing and dividing certain Common Pasture Grounds, called Purton Common and Purton Stoake Common, within the Parish of Purton, otherwise Puriton, in the County of Wilts." Vis. Torrington. L. Bp. Oxon. L. Bp. St. Asaph. Ld. Abergavenny. Their Lordships, or any Five of them; to meet on Wednesday the 2d Day of March next, at Ten a Clock in the Forenoon, in the Prince's Lodgings near the House of Peers; and to adjourn as they please. L. Hobart & al. Pet. referred to Judges. It is Ordered, That the Consideration of the said Petition be, and is hereby, referred to the Lord Chief Justice of the Court of Common Pleas and the Lord Chief Baron of the Court of Exchequer; with the usual Directions, according to the Standing Orders. Order to prevent Stoppages, to be better observed. The House being informed, "That Mr. Baldwin, Deputy to the High Bailiff of Westminster, attended; the said High Bailiff being sick:"
He was called in; and acquainted, by the Speaker, of the Interruption given the Lords by the Carts and Carriages in the Streets and Passages; and asked, "Why their Lordships Order to prevent the same was not better observed?" And he acquainting the House, "That, as soon as he received the said Order, he sent it to Mr. Rawlinson the High Constable, who was attending without." And the said Rawlinson was called in; and informed likewise of the abovementioned Interruption by Carts and Carriages; and inquired of concerning the Observation of the said Order. And he acquainted the House with the Endeavours he had used, and Methods taken, for the Execution of their Lordships said Order; and promised to take what Care he could, for the future, that the same be duly observed. Whereupon he was directed to withdraw. They were accordingly called in, and reprimanded; and enjoined as above directed. Upon reading the Petition and Appeal of Richard O'Farrell Esquire, Executor of Elizabeth O'Farrell his Mother, deceased, who was sole Executrix of her late Husband Brigadier General Fergus O'Farrell, the Petitioner's Father, also deceased; complaining of a Decree of the Court of Chancery in Ireland, of the 17th Day of February 1732, made in a Cause wherein Roger O'Farrell was Plaintiff, and the Appellant and others were Defendants; and praying, "That the same may be reversed; and that the Plaintiff's Bill, as against the Appellant, may stand dismissed, with Costs:"
It is Ordered, That the said Roger Farrell may have a Copy of the said Appeal; and he is hereby required to put in his Answer thereunto, in Writing, on or before Wednesday the 23d Day of March next; and that Service of this Order upon his Clerk in the Court of Chancery in Ireland be deemed good Service. Upon reading the Petition and Appeal of Francis Lynch Merchant; complaining of a Decree of the Court of Chancery in Ireland, of the First Day of July 1736, made in a Cause wherein Martin Killikelly, Arthur Lynch, and Company, were Plaintiffs, and the Appellant and others Defendants; and praying, "That the same may be reversed:"
It is Ordered, That the said Martin Killikelly, Arthur Lynch, and Company, and Catherine Killikelly, and Thomas and James Lynch, may have a Copy of the said Appeal; and they are hereby required to put in their Answer or respective Answers thereunto, in Writing, on or before Wednesday the 23d Day of March next; and that Service of this Order upon their several and respective Six Clerks in the Court of Chancery in Ireland be deemed good Service. Upon reading the Petition and Appeal of Thomas Elliot, Writer in Edinburgh; complaining of several Interlocutors of the Lords of Session in Scotland, of the 17th Day of July and 19th of December 1734, and the 4th of July 1735, and of an Interlocutor of the Lord Leven, the 22d of January 1736, as to such Part of it as repels the Grounds of the Petition; praying, "That Walter Anderson might not be admitted as Witness;" and also complaining of certain other Interlocutors of the said Lords of Session, of the 1st and 14th of July 1736, and 29th of January following, made on the Behalf of Archibald Cockburn; and praying, "That the same may be reversed, altered, or varied; and such other Relief given the Petitioner as to their Lordships great Wisdom shall seem meet:"
It is Ordered, That the said Archibald Cockburn may have a Copy of the said Appeal; and he is hereby required to put in his Answer thereunto, in Writing, on or before Wednesday the 16th Day of March next; and that Service of this Order upon the Respondent's Agent or Procurator in the Court below be deemed good Service. Upon reading the Petition and Appeal of Charles Lauder, the only surviving Son of James Lauder, late Provost and Sheriff Clerk of Haddington, deceased; complaining of several Interlocutors of the Lords of Session in Scotland, of the 17th and 28th Days of February 1719/20, the 8th and 24th of December and 6th of January 1736, made on the Behalf of George Anderson; and praying, "That the same may be reversed; and such Relief given the Petitioner as to their Lordships great Wisdom shall seem meet:"
It is Ordered, That the said George Anderson may have a Copy of the said Appeal; and he is hereby required to put in his Answer thereunto, in Writing, on or before Wednesday the 15th Day of March next; and that Service of this Order upon his Procurator or Agent before the said Court of Session be deemed good Service. Walkinshaw against Duncan Forbes & al. 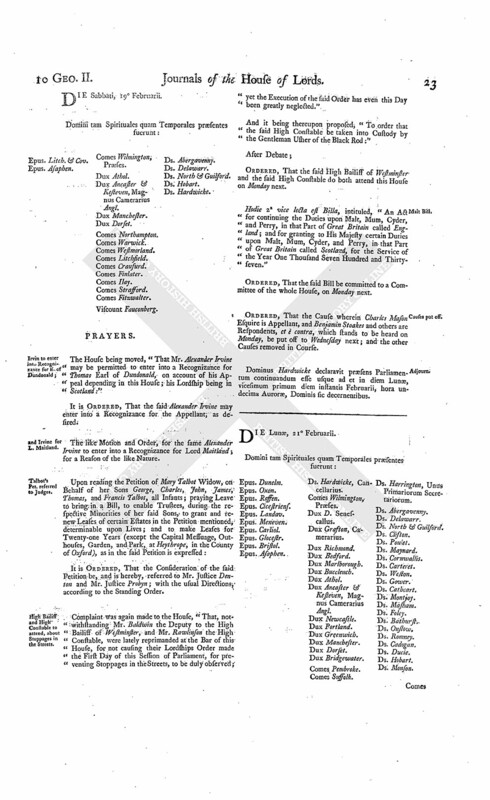 Upon reading the Petition and Appeal of John Walkinshaw, Merchant in Glasgow, only Son of the deceased William Walkinshaw of Scotstoun; complaining of a Decree of the Lords of Session in Scotland, of the 10th of June 1736, and Affirmance thereof the 8th of July following, made on the Behalf of Mathew Crawfurd and James Corbet, Merchants in Glasgow, the Right Honourable the Earl of Eglintone, and Lord Garlies; and praying, "That the same may be reversed; and such Relief given the Appellant as to their Lordships shall seem meet:"
It is Ordered, That Duncan Forbes Esquire, His Majesty's Advocate, and the other Parties abovenamed, may have a Copy of the said Appeal; and do put in their Answer thereunto, in Writing, on or before Wednesday the 15th Day of March next; and that Service of this Order upon the Respondents Attornies, Procurators, or Agents, before the said Court of Session, be deemed good Service. 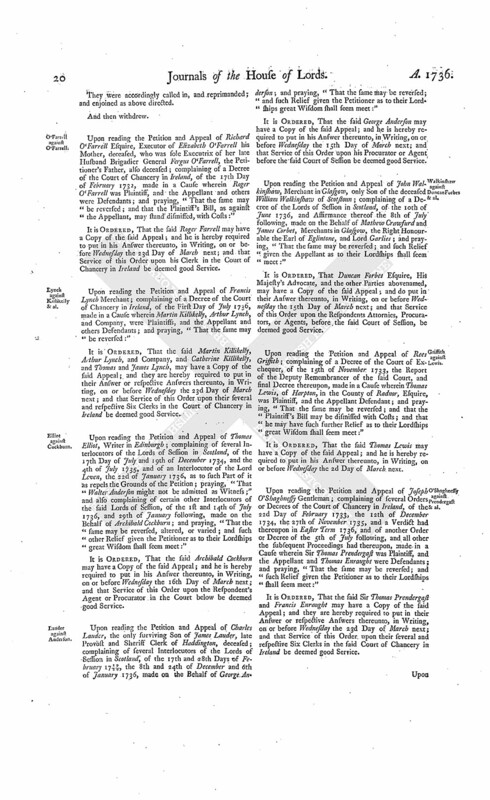 Upon reading the Petition and Appeal of Rees Griffith; complaining of a Decree of the Court of Exchequer, of the 15th of November 1733, the Report of the Deputy Remembrancer of the said Court, and final Decree thereupon, made in a Cause wherein Thomas Lewis, of Harpton, in the County of Radnor, Esquire, was Plaintiff, and the Appellant Defendant; and praying, "That the same may be reversed; and that the Plaintiff's Bill may be dismissed with Costs; and that he may have such further Relief as to their Lordships great Wisdom shall seem meet:"
It is Ordered, That the said Thomas Lewis may have a Copy of the said Appeal; and he is hereby required to put in his Answer thereunto, in Writing, on or before Wednesday the 2d Day of March next. O'Shaghnessy against Prendergast & al. Upon reading the Petition and Appeal of Joseph O'Shaghnessy Gentleman; complaining of several Orders or Decrees of the Court of Chancery in Ireland, of the 22d Day of February 1733, the 12th of December 1734, the 27th of November 1735, and a Verdict had thereupon in Easter Term 1736, and of another Order or Decree of the 5th of July following, and all other the subsequent Proceedings had thereupon, made in a Cause wherein Sir Thomas Prendergast was Plaintiff, and the Appellant and Thomas Enraught were Defendants; and praying, "That the same may be reversed; and such Relief given the Petitioner as to their Lordships shall seem meet:"
It is Ordered, That the said Sir Thomas Prendergast and Francis Enraught may have a Copy of the said Appeal; and they are hereby required to put in their Answer or respective Answers thereunto, in Writing, on or before Wednesday the 23d Day of March next; and that Service of this Order upon their several and respective Six Clerks in the said Court of Chancery in Ireland be deemed good Service. Fetherston & al. against Farrell. Upon reading the Petition and Appeal of Thomas Fetherston and Francis Fetherston Gentlemen, Executors of the last Will and Testament of Robert Jessop Esquire, and Robert Jessop Gentleman, Grandson and Heir of the said Robert, and Robert Jessop, Son and Residuary Legatee of the said Robert Jessop Esquire; complaining of several Orders and a Decree of the Court of Chancery in Ireland; and praying, "That the same may be varied and rectified; and such Relief given the Petitioners as to their Lordships Justice and Wisdom shall seem meet:"
It is Ordered, That Roger Farrell may have a Copy of the said Appeal; and he is hereby required to put in his Answer thereunto, in Writing, on or before Wednesday the 23d Day of March next; and that Service of this Order upon his Clerk in the said Court of Chancery in Ireland be deemed good Service. Magistrates of Montrose against Erskine. 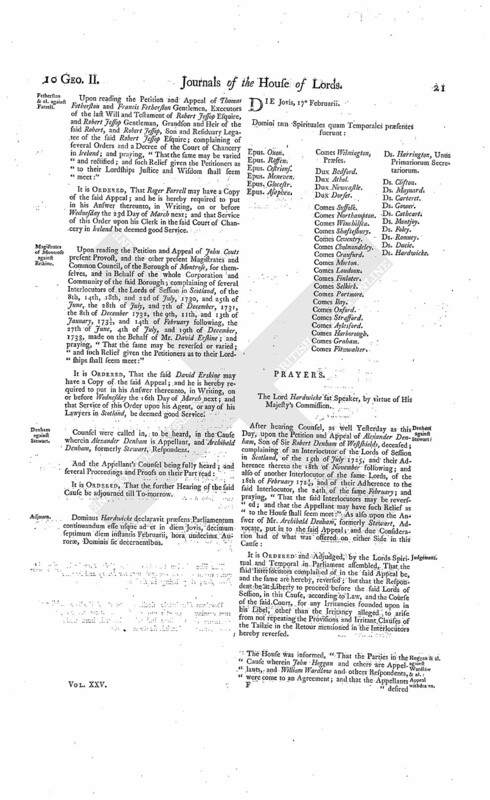 Upon reading the Petition and Appeal of John Couts present Provost, and the other present Magistrates and Common Council, of the Borough of Montrose, for themselves, and in Behalf of the whole Corporation and Community of the said Borough; complaining of several Interlocutors of the Lords of Session in Scotland, of the 8th, 14th, 18th, and 22d of July, 1730, and 25th of June, the 28th of July, and 7th of December, 1731, the 8th of December 1732, the 9th, 11th, and 13th of January, 1732/3, and 14th of February following, the 27th of June, 4th of July, and 19th of December, 1733, made on the Behalf of Mr. David Erskine; and praying, "That the same may be reversed or varied; and such Relief given the Petitioners as to their Lordships shall seem meet:"
It is Ordered, That the said David Erskine may have a Copy of the said Appeal; and he is hereby required to put in his Answer thereunto, in Writing, on or before Wednesday the 16th Day of March next; and that Service of this Order upon his Agent, or any of his Lawyers in Scotland, be deemed good Service. Counsel were called in, to be heard, in the Cause wherein Alexander Denham is Appellant, and Archibald Denham, formerly Stewart, Respondent. Dominus Hardwicke declaravit præsens Parliamentum continuandum esse usque ad et in diem Jovis, decimum septimum diem instantis Februarii, hora undecima Auroræ, Dominis sic decernentibus. 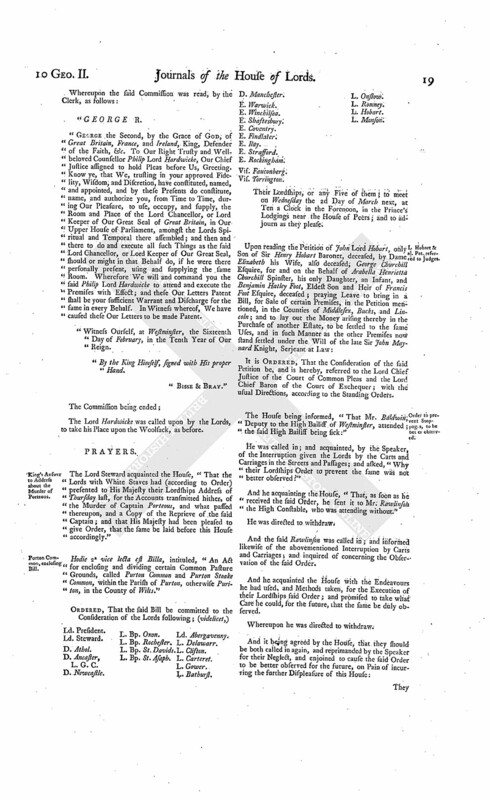 It is Ordered and Adjudged, by the Lords Spiritual and Temporal in Parliament assembled, That the said Interlocutors complained of in the said Appeal be, and the same are hereby, reversed; but that the Respondent be at Liberty to proceed before the said Lords of Session, in this Cause, according to Law, and the Course of the said Court, for any Irritancies founded upon in his Libel, other than the Irritancy alleged to arise from not repeating the Provisions and Irritant Clauses of the Tailzie in the Retour mentioned in the Interlocutors hereby reversed. Hoggan & al. against Wardlaw & al. Appeal withdrawn. The House was informed, "That the Parties in the Cause wherein John Hoggan and others are Appellants, and William Wardlaw and others Respondents, were come to an Agreement; and that the Appellants desired Leave to withdraw their Appeal; and that the Respondents consented thereto." Ordered, That the Appellants have Leave to withdraw their Appeal, as desired; the Respondents consenting thereto. Dominus Hardwicke declaravit præsens Parliamentum continuandum esse usque ad et in diem Veneris, decimum octavum diem instantis Februarrii, hora undecima Auroræ, Dominis sic decernentibus. With a Bill, intituled, "An Act for continuing the Duties upon Malt, Mum, Cyder, and Perry, in that Part of Great Britain called England; and for granting to His Majesty certain Duties upon Malt, Mum, Cyder, and Perry, in that Part of Great Britain called Scotland, for the Service of the Year One Thousand Seven Hundred and Thirty-seven;" to which they desire the Concurrence of this House. With a Bill, intituled, "An Act for naturalizing Joseph Pouchon;" to which they desire the Concurrence of this House. Magens & al. Nat. Bill. With a Bill, intituled, "An Act for naturalizing Nicholas Magens, John Timmerman, and Theodore Davel;" to which they desire the Concurrence of this House. The said Bills were severally read the First Time. V. Molyneux & al. Pet. referred to Judges. It is Ordered, That the Consideration of the said Petition be, and is hereby, referred to Mr. Justice Probyn and Mr. Justice Lee; with the usual Directions, according to the Standing Orders. The House being moved, "That Jeffery French Esquire may be permitted to enter into a Recognizance for Richard O'Farrell, on account of his Appeal depending in this House; he being at Port Mahon:"
It is Ordered, That the said Jeffery French may enter into a Recognizance for the Appellant, as desired. The like Motion and Order, for Mr. John Walkinshaw, of St. James's, Westminster, to enter into a Recognizance for John Walkinshaw Merchant; he being in Scotland. The like Motion and Order, for John Lawder Esquire to enter into a Recognizance for Henry and Francis Fetherston; they being in Ireland. Dominus Hardwicke declaravit præsens Parliamentum continuandum esse usque ad et in diem Sabbati, decimum nonum diem instantis Februarii, hora undecima Auroræ, Dominis sic decernentibus. The House being moved, "That Mr. Alexander Irvine may be permitted to enter into a Recognizance for Thomas Earl of Dundonald, on account of his Appeal depending in this House; his Lordship being in Scotland:"
It is Ordered, That the said Alexander Irvine may enter into a Recognizance for the Appellant, as desired. and Irvine for L. Maitland. The like Motion and Order, for the same Alexander Irvine to enter into a Recognizance for Lord Maitland; for a Reason of the like Nature. Talbot's Pet. referred to Judges. It is Ordered, That the Consideration of the said Petition be, and is hereby, referred to Mr. Justice Denton and Mr. Justice Probyn; with the usual Directions, according to the Standing Order. High Bailiff and High Constable to attend, about Stoppages in the Streets. Complaint was again made to the House, "That, notwithstanding Mr. Baldwin the Deputy to the High Bailiff of Westminster, and Mr. Rawlinson the High Constable, were lately reprimanded at the Bar of this House, for not causing their Lordships Order made the First Day of this Session of Parliament, for preventing Stoppages in the Streets, to be duly observed; yet the Execution of the said Order has even this Day been greatly neglected." And it being thereupon proposed, "To order that the said High Constable be taken into Custody by the Gentleman Usher of the Black Rod:"
Ordered, That the said High Bailiff of Westminster and the said High Constable do both attend this House on Monday next. Hodie 2a vice lecta est Billa, intituled, "An Act for continuing the Duties upon Malt, Mum, Cyder, and Perry, in that Part of Great Britain called England; and for granting to His Majesty certain Duties upon Malt, Mum, Cyder, and Perry, in that Part of Great Britain called Scotland, for the Service of the Year One Thousand Seven Hundred and Thirtyseven." Ordered, That the Cause wherein Charles Mason Esquire is Appellant, and Benjamin Stoakes and others are Respondents, et è contra, which stands to be heard on Monday, be put off to Wednesday next; and the other Causes removed in Course. Dominus Hardwicke declaravit præsens Parliamentum continuandum esse usque ad et in diem Lunæ, vicesimum primum diem instantis Februarii, hora undecima Auroræ, Dominis sic decernentibus.